The citrus woolly whitefly was reported for the first time in East and Central Africa in the early to mid 90s. Serious attacks on citrus were observed in Kenya, Malawi, Tanzania and Uganda. The adults of this whitefly resemble small white moths, covered with mealy white wax. Eggs are laid on the lower surface of young leaves. The young stages resemble soft scale insects and have a woolly appearance. They produce large quantity of honeydew that leads to the growth of sooty mould on the infested trees. This may cause defoliation, loss of fruits and dwarfing of trees. Small, mottled fruits are produced. 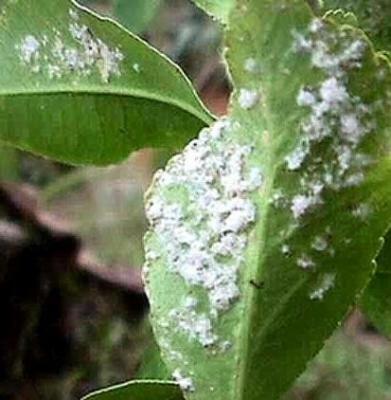 The citrus woolly whitefly is kept under control by its natural enemies in its area of origin. In the mid to late 90s, one of the most efficient parasitic wasp (Cales noacki), which has controlled this pest in many countries, was introduced and released in Kenya, Malawi, Tanzania and Uganda. Data collected in Kenya and Uganda showed that this parasitic wasp is effectively controlling the citrus woolly whitefly. Use of pesticides should be avoided since it may kill this parasitic wasp. Moreover, chemical control is not economically feasible. 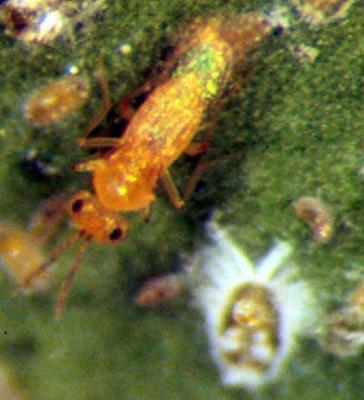 Pesticides are often inefficient since the immature stages are covered by wax. When effective, pest resurgence commonly occurs within a few weeks of application.